Now you need every card in your deck to stop aggro or control because there are more refuel cards. Playing this card makes your deck bad at the moment. There are a lot more cheap small legendaries then back in the day, so playing it now makes your deck less of a threat then back in the day. That's why this awesome card saw play. Reno mage and control priest run it as well. Even as a veteran I can see where you are coming from as a new player, because looking back on it now it is kinda funny to think this card was one of the best cards for control decks at the time, when the meta was SO fast. But back then there was lots of good removal so even really slow decks weren't punished that much, and they typically had a lot of card draw too so drawing into said removal wasn't much of an issue. In the control mirrors it was often decided by who could "Turbo Elise" and turn all your worthless cards that were meant for aggro plus card draw into legendaries, and there were tons of good ones. 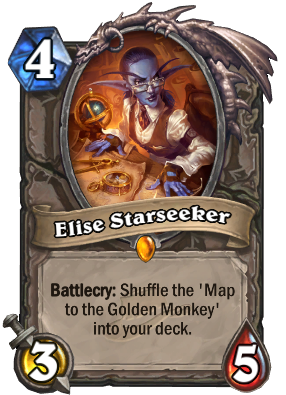 You could even get another Elise from the Golden Monkey. One day this card will be played again ... Miss it ! Elise: Brann! Reno! Hide the artifacts! Reno: Well, it'd be too obvious. Rafaam's pet snake Fluffy is in this Hakkari Blood Goblet. So, what do i do? Elise: Well, ask Brann. He can hide it...Wait! Brann! What are you doing, pulling out all the artifacts?!?! Brann: Bu-bu-we don't wanna give up this Benediction Spinner. Majordomo Executus used it to pick his teeth! I also would hate to lose Khadgar's Pipe. Khadgar would have a fit! Elise: It's either that or our lives! one day i will play this card. Until then i will keep dreaming. Is this card worth keeping or should I dis chant for other cards? 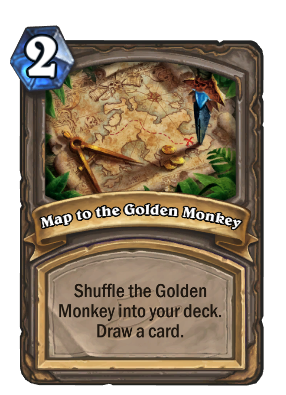 Okay, so I used Elise turn 1, got the map then the monkey early... Used the monkey and ended up with Reno in my hand later... I didn't get full HP on battlecry. Why is that? How is the new deck formed after using the monkey? There should only be 1 of every card since they're all legendary.... right? 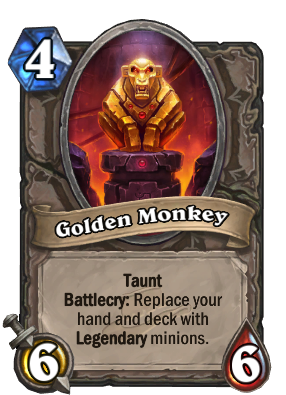 Golden monkey may generate duplicate legendaries. I remember when this card was first announced we thought it wouldn't be practical and just a gimmick. Turns out we were wrong. Elise is perfect for Control decks. It's come to the point where she's an auto include like Dr. Balanced was. Early on she's a solid body, and late game the Golden Monkey helps with bigger threats. Yeah let's ignore combo Priest, Druid, Renolock, or any other control deck. Just Fatigue Warrior. Alright. If you deck is so great, post it and let's take a look. I'm playing her in my reno rogue.... somehow i won against a control warrior and a control priest thanks to the monkey. I Love this card.